(PRLEAP.COM) March 21, 2019 - When it comes to the corporate world, there's no denying our allegiance to tech. Companies reach out to customers through internet ads and social media campaigns. They streamline customer service with voice-activated phone systems, and lower production costs by acquiring robots to do everything from picking strawberries to painting cars. But does he who acquires the most technology really win? Not according to Jad Mawlawi, founder of marketing firm Dooply. Mawlawi says that what really makes a business successful is human connections. "We need to reemphasize our human significance and make humans the center of every conversation again," said Mawlawi. "We are all overwhelmed with robots and automation when the real opportunity today lies in human connections and relationships." That's where his company Dooply comes in. The Humanist Movement - Mawlawi said that the tech frenzy is not a unique phenomenon but rather a modern iteration of a movement seen repeatedly in history with people reaching for the divine. This fascination with the supernatural took the form of religiosity or even witchcraft in some eras as people sought for something beyond the human dimension. Mawlawi asserts that the tech-race is today's form of this supernatural seeking as we look toward robots and AI to enhance our lives. But Mawlawi said that just as the Renaissance drew us away from the supernatural toward human development and increased human consciousness, there is a movement afoot today to return to humanism. "Humanism is a rationalist system of thought attaching prime importance to the human rather than the divine or supernatural." Says Jad Mawlawi. "Humanist beliefs stress the potential value and goodness of human beings, emphasize common human needs, and seek solely rational ways of solving human problems." Why Jad Mawlawi's Company Focuses on Humanism - According to Mawlawi, "Societies today are in a bubble similar to the one they were trapped in prior to the Humanist movement." Mawlawi said that there is a longing of the human spirit, though, to re-connect in personal ways through establishing meaningful relationships. 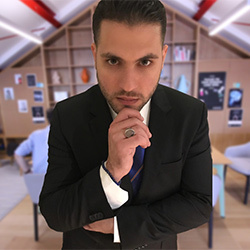 Mawlawi said that the tech world is highly saturated, making it difficult to launch new tech-related companies, and that entrepreneurs would do better to meet the human need to connect. One way to do this is by assigning meaning to your goods or services. So rather than simply selling a candy bar, a company could sell a bar cultivated from cacao beans grown with sustainable farming practices. All of the sudden, you're not just peddling a tasty snack but something that will help protect the livelihoods of farmers in West Africa. People want to believe that their purchases are making a difference in the lives of other people. A return to humanism can also be accomplished through effective branding. Companies should develop a company story that people can relate to and communicate regularly through blogging and other activities in an authentic voice. They should also focus on building strong relationships with core customers rather than simply on acquiring more and more customers. "Today we need to prioritize quality over quantity and quality is best when it is most human," said Mawlawi. In short, technology is important and exciting, but when it comes right down to it, we're all people-and people need other people. Businesses can't afford not to get ahead of the burgeoning humanist movement and make genuine, meaningful connections with their customers. To learn more about human-to-human marketing, contact Jad Mawlawi at Dooply.com.